What is a sheet metal screw? 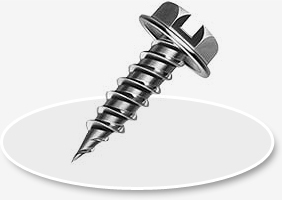 A sheet metal screw is a kind of hardware supply, which is used for tightening metal objects. This kind of fastener features a threaded shank along-with a flat/rounded head. Unlike wooden rivets, which are threaded only partially, the above mentioned screw’s shank is entirely threaded. The tip and the threads are quite sharp, thereby enabling them to easily get cut through the hard metal surface or any other type of surface. These types of fasteners are used to fasten one metal object with another and are also used to attach metal object with a wooden, plastic or any other kind of surface. These are usually represented by a series of 3 unique numbers, which explain the diameter, length and thread count of each screw. For instance, a fastener listed as 6-30 x 1″ explains that its diameter is of 8 and is 1 inch long and that it consists of 32 threads. The diameter of such type of rivet is determined by referring a chart developed by the American National Standards Institute (ANSI), where a size of 8 may be similar to a number of various sizes depending on the type of screw. Commonly there are two types of metal sheet screws available in the market. While standard units feature a pointed tip, which is ideal for cutting into the metal surface, the thread-cutting or self tapping screws feature a notched tip, which can easily cut into the metallic surface without pre-drilling. But pre-drilling is required for the standard types, featuring a pointed tip. The heads of such fasteners are available in several different types and are chosen, determining the type of the job requirement. The round/pan headed screws protrude above the surface after their installation. The flat or oval shaped fasteners sit smoothly on the top of an object, thereby reducing wind resistance and enhancing the application of the installation. In addition to, these types of fasteners can have Phillips, square or flat slots, depending upon the type of the tool used for installation. The head plays a relevant role in applications of sheet metal screws. The shaft of these fasteners is threaded all the way up to the head, thereby allowing better retention to other materials. The pan head types feature either Phillips-head or slotted-head varieties. These type of rivets are characterized by their protruded head, raised above the surface of the material, which is supposed to be fastened. These types are available in zinc-plated, white-coated, black-coated and non-coated stainless steel. The oval head types of sheet metal screws resemble the regular flat head screws, but have slight variation. These rivets feature more girdles on top, which help in providing a more finished appearance. These screws are also available in stainless steel and also in zinc-plated. their heads can be either Phillips-head or slotted head. Flat head screws, which feature both Phillips and slotted-head styles, are considered as the best countersunk for any kind of material. These are available in various coatings and finishes. Self-drilling types are available in pan head and flat head designs. They are quite similar to the regular screws, except for the additional feature of a drill point at the tip. These can be screwed only by Phillips head screwdrivers and are made up of zinc-plated and stainless steel. Hex washer screws are another commonly used type of sheet metal screws. These rivets are enabled with a hexagonal head and a washer so as to secure the shaft. These come in zinc-plated and stainless steel. They are available in a standard self-drilling type and are sometimes enabled with an additional bonded neoprene washer. The sheet metal screws are used to connect two different pieces of metal. These rivets are also used for quick and strong fastening of metal to aluminium, plastics, hard rubber and even plywood.